The Dalite Perm-Wall 54 x 96" Fixed Frame Projection Screen is perfect when you need a screen that always needs to be there. No wires, no electrical connections, no remotes - just a reliable well-built screen for those important seminars, meetings or lectures. This reasonably priced screen provides a flat, bright viewing area that readily lends itself to video or data projection. The rugged frame holds the projection surface tightly with a simple "snap". For either front or rear projection, the Perm-Wall is well-named. Designed for permanent mounting to the wall or in a wall opening. Front or rear projection surfaces snap easily on to the front of the silver aluminum frame. Flat back and sides for easy installation. 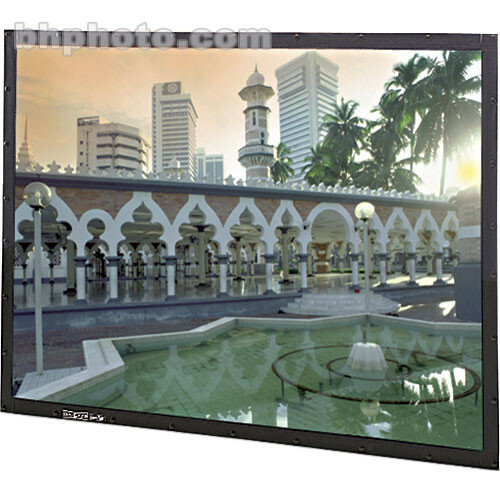 Provides a perfectly flat viewing surface for graphic and data video projection. Da-Mat, High Contrast Da-Mat, Da-Tex (Rear), Pearlescent, Cinema Vision, High Contrast Cinema Vision and Dual Vision fabrics up to and including 16' high will be seamless. Audio Vision, High Contrast Audio Vision and High Contrast Cinema Perf fabrics up to and including 8' high will be seamless. High Power fabric up to and including 6' high will be seamless. Box Dimensions (LxWxH) 64.0 x 9.0 x 6.0"